[Episcopal News Service – Washington, DC] Love your neighbor, the neighbor you like and the neighbor you don’t like, your black neighbor, your white neighbor, your Latino neighbor, your Muslim neighbor, your Christian neighbor, your Democrat neighbor, your Republican neighbor. 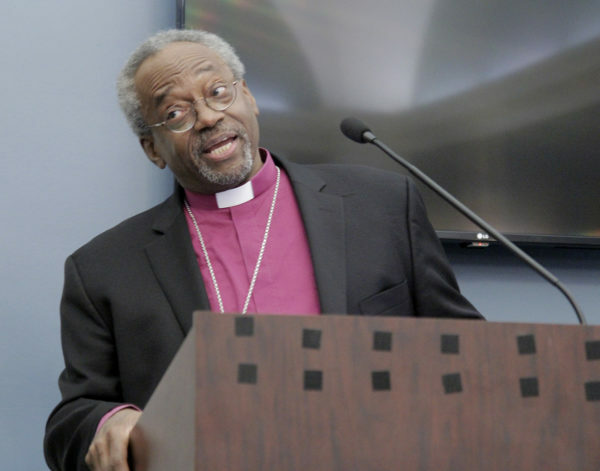 That was the message Presiding Bishop Michael Curry took to a standing-room-only crowd that overflowed onto the steps at National City Christian Church and into the Lutheran church across the street here on May 24. During the 90-minute church service that preceded a candlelight procession to the White House, one by one speakers addressed issues ranging from the rise of white nationalism to mistreatment of and violence against women, to LGBTQ inclusion to immigration reform, the spreading of falsehoods and the normalization of lying and moves toward autocratic leadership. “The Reclaiming Jesus declaration says that we believe there are two things are at stake: the soul of the nation and the integrity of our faith,” said the Rev. 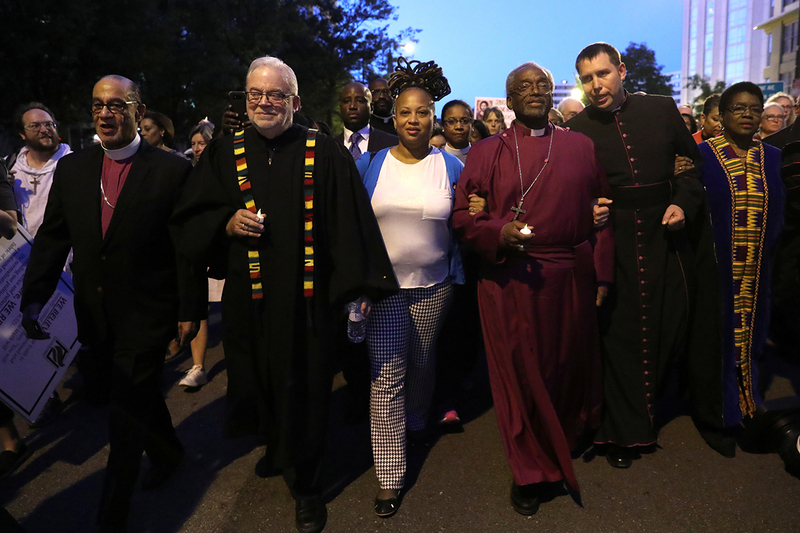 Jim Wallis of Sojourners, who co-led the service and the procession alongside Curry. “Why do we say that? Because we love our country and we love our churches even more. We see people bringing politics into faith. Tonight, we are bringing faith into politics. “And there’s a big difference. … The early Christians did everything they did in the name of Jesus, not in the name of their churches or organizations. The service and procession of public witness were part of “Reclaiming Jesus: A Confession of Faith in a Time of Crisis,” an ecumenical Christian elders’ initiative launched in March to “reclaim Jesus” from those believed to be using Christian theology for political gain. In total, more than a thousand people processed in public witness by candlelight from National City Christian Church to the White House, where they reassembled across the street in Lafayette Square Park and sang “This Little Light of Mine” before crossing the street to stand on the sidewalk directly in front of the White House. The events in Washington followed last weekend’s royal wedding, where Curry delivered a sermon on the power of love at St. George’s Chapel in Windsor, garnering him international attention. During a May 25 event at the National Press Club, Wallis said God used a royal wedding to get people to start talking about Jesus, before turning the podium over to the presiding bishop. “The truth is, I suspect, what began to happen last night and has been building and is just beginning is maybe we are helping – no, maybe the spirit is helping the church to re-center itself and its voice on Jesus,” said Curry. “Maybe the spirit is helping us to reclaim Christianity, not as ideology, not as anybody’s political party. Jesus can’t be bought. But to re-center Christianity and have it named and heard and understood as grounded in the teachings of Jesus, who said blessed are the poor, blessed are the poor in spirit, the Jesus who taught us love God and love your neighbor, the Jesus of the parable of the Good Samaritan … to re-center ourselves on this Jesus. Since its release, other Christian leaders have requested to sign on to the statement, and more than 2 million people worldwide have accessed it. The elders conceived of it as a tool for discipleship intended to move people to the streets in their own communities. In an interview with Episcopal News Service on May 25 following the press club event, Curry encouraged Episcopalians to study and reflect on the Reclaim Jesus declaration and study materials. “It’s a document worth studying, it’s grounded in scripture, it’s based in theology, it’s an attempt to articulate some of the core Christian beliefs that have to do with our values and our values having their origin in the teachings and spirit of Jesus,” he said. Adult formation, Bible studies and other groups can use the document and the study guide to come to areas of agreement and disagreement and to reflect on them. “This is not the word from on high, but it can be used to help people identify what are the core Christian beliefs that actually matter in my life, and how do I live them out following the teachings of Jesus,” he said. “And then what action steps will I take, what actions steps will we take to be witnesses to this way of following Jesus in our lives. 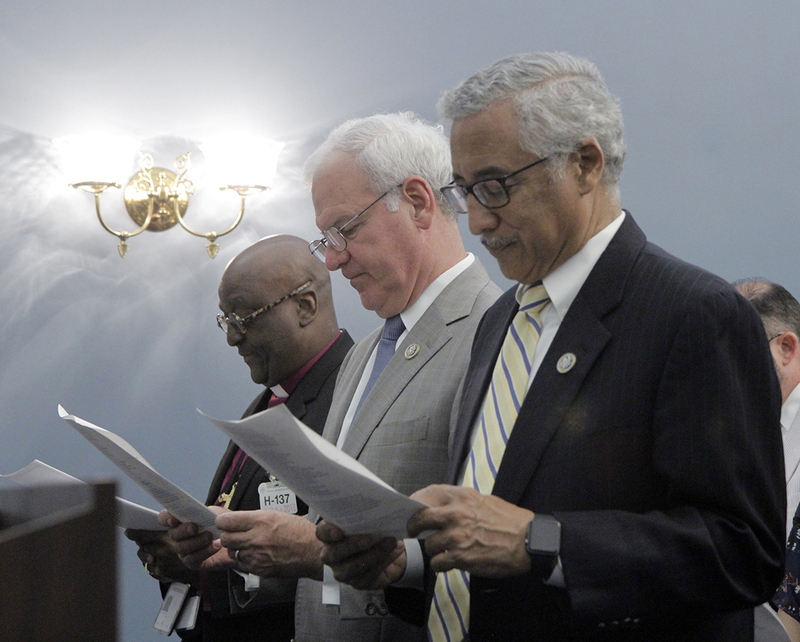 The previous day began at the U.S. Capitol, where Curry led a packed room in a bipartisan Morning Prayer, organized by the Office of Government Relations and co-hosted by Republican Rep. Bradley Byrne of Alabama and Democratic Rep. Bobby Scott of Virginia, both Episcopalians. Today, at least 38 of the 535 citizens serving in Congress identify as Episcopalians: 22 Republicans and 16 Democrats. In November 2017, Episcopal News Service interviewed several Episcopalians who serve in Congress to report on the range of ways faith influences lawmakers’ public service. Nine senators and representatives attended Morning Prayer. Afterward, the presiding bishop met with lawmakers from both parties to highlight the church’s advocacy and to share its perspective on civil discourse. In meetings with members of Congress, the presiding bishop spoke about the need to come together in diversity on issues relating to immigration, poverty and criminal justice reform. The Office of Government Relations – housed on Capitol Hill – carries out the church’s nonpartisan, values-based agenda. Every three years, the Episcopal Church’s General Convention meets to conduct church-related business and to discuss and pass legislation ranging from revisions of the Book of Common Prayer to resolutions supporting criminal justice and immigration reform. Episcopalians can join the Episcopal Public Policy Network to become involved in this work. Churches and religious communities have a constitutional right to petition the government. The First Amendment’s Establishment Clause does not prohibit churches from meeting with, educating or advocating to elected officials with the aim of creating laws in line with the churches’ values. Throughout U.S. history, religious communities have engaged politically on issues of the era: from abolition to civil rights movements to immigration reform. 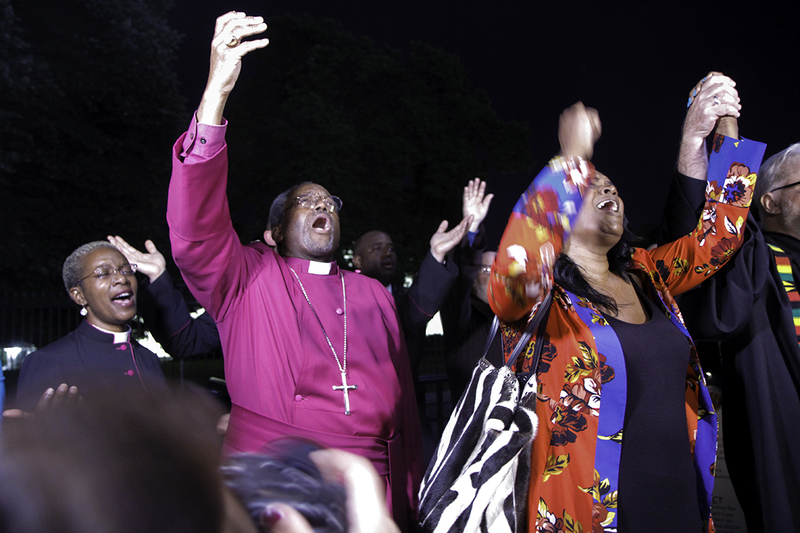 Reclaiming Jesus is just one ecumenical campaign joined by the Episcopal Church. Others include Pray Fast Act and the Poor People’s Campaign. 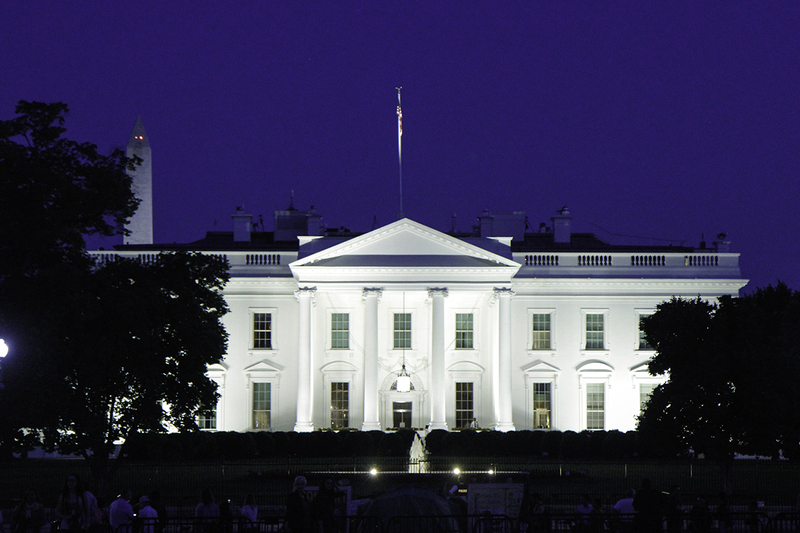 More information about the Episcopal Church’s Office of Government Relations is available here. For more information about or to join the Episcopal Public Policy Network, click here. — Lynette Wilson is managing editor of Episcopal News Service. “…This is not a protest march…the presiding bishop spoke about the need to come together in diversity about Immigration reform, revisions to the Book of Common Prayer and criminal justice..” . This is lib dogma. ladies and germs. Meanwhile in Oxnard, California, Franklin Graham told hundreds of SEIU (liberal) government workers and mostly Hispanic families with children about the authentic love of Jesus. He moves on to Modesto, Berkeley, Chico and Redding by June 5, the date of the California primary election. Jim Wallis espouses the evangelical Left. He was a spiritual advisor to Barack Obama. Their ilk feels that conservative Christians spend too much time concerned with homosexuality and abortion. Wallis supported Obamacare. These are the intellectual and spiritual giants favored by the Episcopal Church leadership and the Pope, who affirms that homosexuals are “born that way”. There are clergy who want to sign the statement. How do they do so? Government and law at their best reflect the highest values of their people. A nation with a significant number of Christian people should at least reflect on the values of Jesus as they determine the way that nation will act. The care of those who are weak, sick, outcast finds a prominent place in the New Testament, but you don’t have to be a Christian to know that those who are well off have an obligation to those who are not. How we treat one another and speak to one another need not be enshrined in law — civil or religious. But clearly something has gone awry and truth and civility seem to have perished. Thanks be to God that responsible Christian leaders are finally standing up to the rantings of the fringe elements of the Reagan/Falwell/Robertson ilk who have misrepresented conservative Christianity for half a generation.There is a case to be made for showing Christian courtesy to these groups but the time for silence is over. So the time for silence is over regarding the “rantings” of Christian conservatives S.R. Price? Here’s a news flash. A lot of progressive members of the clergy do their own share of ranting as well. You just happen to agree with them. You may look at Pat Robertson’s interpretation of the Gospel with contempt, but I’ll just bet our Lord loves him just as much as He does Bishop Curry. So why don’t you do the Christian thing and get down off your self-righteous high horse and realize that Jesus loves EVERYONE regardless of where they lean socially or politically and doesn’t put anyone above or beneath anyone else. Maybe someday you’ll have a come to Jesus moment and realize that, but frankly I’m not holding my breath. Responsible Christian leaders don’t only come from the left. Terry, unfortunately the religious leaders of the Episcopal Church and the other mainstream churches do represent the progressive left. We who have been branded heretics for believing in America First have to come to grips that the progressive church ship has left the dock. The course of the church has now been set and will not change. The Nation that has provided the freedom for churches to grow and thrive now is viewed as the enemy not worthy of any more respect than those run by despots and dictators. The church leaders have a dream for a one world future in which they will rule . No matter all will eat with their fingers and shiver in the cold. History is not on the side of the Church progressive dreamers. Unemployment among African Americans and Hispanics is at the lowest in years – certainly much lower than before Mr. Obama’s administration. We are likely seeing the end of the cold war with the Koreas thanks in large measure to Mr. Trump’s change of policies which had not worked for 60 years. Americans – The Unsung Dreamers – are keeping a fraction more of their earnings to help their households and their hopes and dreams. There is now decreased illegal immigration which, in fact, often does contain large numbers of criminals fleeing from justice in their lands. ISIS has been all but decimated and contained. The Nuclear Deal with Iran has been scrapped; a smart move to make considering that deal would require the United States to protect Iran from an attack by Israel. Agreements with Muslim extremists who yell “Death to America” in their Parliament after they got the signed Iran deal seemed a hollow victory and one certain to cost us dearly. This is the real Put America First and it’s a darned good idea! Furthermore, spending more money at home on roads, infrastructure, schools, and more makes sense – if you use public facilities. Mr. Trump is oafish, a blowhard, and not as cultured as slick politicians (meaning he doesn’t hide his sins as well as JFK, FDR, and others). I wish that he would clam up more often. Light a candle in front of his House and tell him to shush up and straighten up. 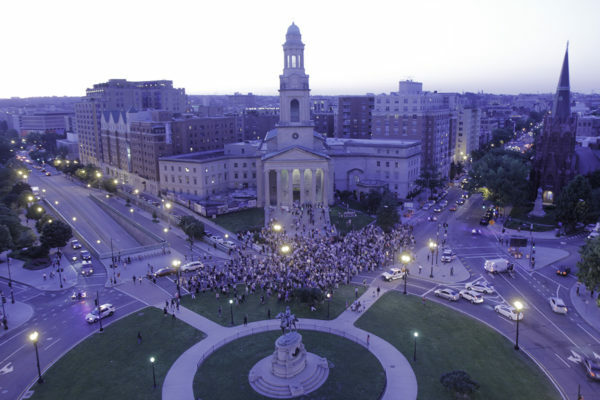 But, where was the March and witness on up the street – up the steps of the Capitol Building? Some of the biggest liars, frauds, extortioners, race-baiters, and ne’er do wells can be found there. Up the steps are Democrats who want to roll back the modest middle class tax cut (goodbye dream). The same Democrats are howling over ending the Iran deal. There are Democrat lawmakers actually defending MS-13 after Mr. Trump called them “animals” – which they are. What else would you call a gang who, in Maryland, stabbed a man more than 100 times and then decapitated him, dismembered him, and ripped his heart out of his body? Mr. Trump pushed to end federal funding of Planned Parenthood – an abortion industry that spent over 50 million dollars in lobbying for Democrat lawmakers since 2012. Does that sound like they need a federal subsidy? The swamp is deep. This March was mainly Obama-era Democrats rightly criticizing some of Mr. Trump’s foibles, but this March was also of the willfully selective who left some much-needed attention off the issues that would embarrass them. What’s the March of the Month for June? Thank you Ron. We should be honoring those who gave their lives for our benefit. We would not be having political or theological discussions without their sacrifice. This forum would not exist. The march was held on the 24th and this post was on the 25th. Memorial Day is on the 28th. Perhaps the Bishop, et.al. could have considered this before scheduling the protest. Then again maybe they did. There was no awareness of the sacrifices honored on Memorial Day in any of the comments by the Bishop. Perhaps those will come in a less publicized setting. Just any observation. Having followed this News Service for some time, I’ve become familiar with the works of the Office of Government Relations and its sub organization, the Episcopal Public Policy Network. The OGR & EPPN are far from non-Partisan. One needs only to go to both pages to see that TEC is truly a Liberal/Progressive biased organization promoting climate change, immigration reform, social justice reform issues, refugee resettlement, and other liberal values. Either the PB is not aware of what these two offices in his organization are doing or he is intentionally misleading us. This article does a great job of masking the church’s true intent and is misleading in sense that TEC would like us to believe, which it is in part, reclaiming Jesus but only under liberal terms. The March ended at the White House. That itself is a statement of intent, and by extension a statement of criticism as the marchers faced the House vocalizing prayers and songs. If the March was a bipartisan one then their legs should have carried them further to the Capitol. Ending at the White House shows that these folks had a message for a certain person. I am a bit confused about what a Liberal/Progressive agenda. Does it mean a difference in how problems are tackled by conservatives and liberals? Many countries including US are grappling with the fact that the weather pattern has changed – colder areas are getting warmer, warmer areas are experiencing cooler temperatures, more flooding, more storms, etc. I take it the refugee resettlement has to do with people from Middle East whose cultural & religious norms are different. But why are there so many refugees in the first place? It is interesting that Senator McCain has acknowledged that invading Iraq was a big mistake. That war cost many lives, destroyed many cities, brought chaos to Middle East, created refugee problem all the while believing that Christian God is on US side. It is time each Church takes a closer look at their own agenda and determine whether their choices are truly Biblically based. I personally don’t think Jesus was a conservative. PJ, being a veteran myself I can certainly understand the need to honor those who made the ultimate sacrifice on this Memorial Day. But while I honor these fallen men and women I can’t help but wonder what they would think of this country today. Progressives are changing or trying to change this country in every way imaginable. Many despise this country and everything it stands for. They call love of country “blind patriotism”, demand open borders and support sanctuary cities, demand that transgenders be given the right to use the public rest rooms of their choice even if their anatomy doesn’t match it in the name of “human dignity”. The same people who in spite of the civil rights movement still demand reparations for african americans (of which I am one), the same people who consider the constitution and the bill of rights irrelevent documents because many of the framers were slave holders, the same people who through intimidation, ridicule, and violence seek to silence anyone who disagrees with them on colleges campuses, (and who also don’t want the ROTC on campus as well) the same people who consider this country immoral, racist, hatemongering, and a curse rather a shining beacon to the world. I guess I can’t help but wonder if the fallen could see this country now would they ask is THIS what I gave my life for? A country where so many now sneer at tradtional values, faith, and love of country? I can’t help but wonder what many of the fallen who were Episcopalians would think of their church today. A denomination that has been virtually taken over by the progressive left who all but ignor the concerns of its conservative members. Can’t help but wonder. Happy Memorial Day to my fellow vets. Joe, you are right Jesus wasn’t a conservative, but He sure as heck wasn’t a progressive either! He trascended both lables. Terry, I agree…Jesus transcends both labels. Thank God for ++Michael, speaking the Gospel of Love. If you can find a “conservative” way to express that, fine. But separating children, depriving people of healthcare (especially women to affordable basic healthcare), racism, giving huge tax credits to the rich while their corporations don’t pay a liveable wage and putting us trillions of dollars in debt and beholden to China isn’t exactly conservative. Ignoring climate change isn’t conservative, it favors polluting businesses over clean businesses while creating misery for many people on this planet – poor people, mostly. Please. ++Michael’s message and TEC only looks “left” because the “right” has aligned with fascism. I think the Episcopal Church claims to be nonpartisan for tax purposes, but I don’t think anyone has ever made that claim with a straight face in real life. Something I observed watching Media reaction to the P.B.’s speech and march is that many people don’t understand that the word Episcopalian is a noun and shouldn’t be used as an adjective.The same can be said for the word Democrat ,which when used as an adjective is either bad grammar or a Fox News term of derision for not only Democrats but is meant to express an autocratic contempt of the concept of democracy itself. The Reagan/Falwell/Robertson swipe is passive aggressive nonsense for sure but why not toss in the Pope too? A question for Cynthia Katsarelis. Would your Republican father be surprised to hear that under Obama, a Democrat, children were locked in cages and separated from their family? Probably not as I’m sure he remembers when another Democrat President ordered innocent Japanese CITIZENS to be locked up! Maybe he would also remember the Chinese Exclusion Act. I bet he wouldn’t be surprised that partisans are so eager to take a shot at the “other side” that they insincerely shame it for what “their side” has done. The concept of glass houses, casting the first stone, or a log in one’s eye is missing here. So is the Bishop’s love your neighbor message. That said, Bishop Curry’s message would be more easily consumed if he didn’t wrap it in a narrative disclaiming his, and tbe Church’s, everpresent far left partisan leanings.